INDIA . . . TravelMap . . .This leg of my journey begins at Bohdgaya, where the Dalai Lama helped me to understand how desire and envy has caused me unhappiness with emotional pain. Three more months wandering in India is likely to open me to more spiritual and psychological revelations. 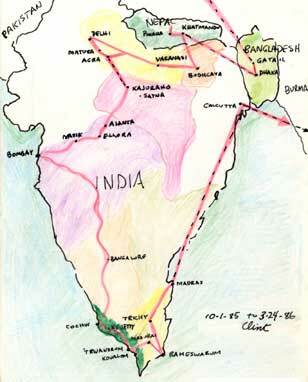 I leave India near at Madras, near the southern tip of India.